On the Tendring Peninsula and a five minute drive from Clacton-on-Sea, Jaywick Sands is well-known for its beautiful non-commercial beaches and the choice for those who want a quiet break. 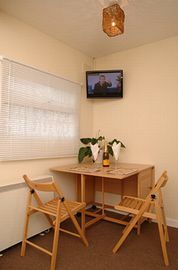 Seaside Cottage is a two minutes stroll to the beach. There are also regular buses from Jaywick Sands to the centre of Clacton-on-Sea, a resort offering everything needed for a traditional seaside holiday. 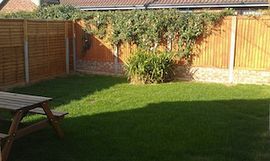 Jaywick Sands is an ideal base for exploring due to its proximity to Colchester, the country's oldest recorded town and Constable Country with its beautiful countryside and villages of Dedham, Flatford and Stratford St. Mary. Pets will love it! Please note that there are no summer dog bans on the beach nearest Seaside Cottage - restrictions come in to force further down the beach towards Clacton but these are outlined in the cottage welcome information and reminders should be clearly visible on the beach. 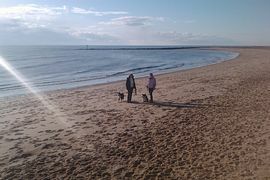 2 minute walk to the beach with no summer dog bans! 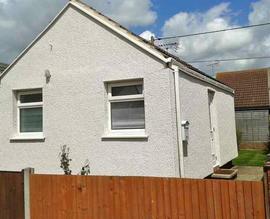 A bungalow, on one level therefore useful for those who have difficulty with stairs. 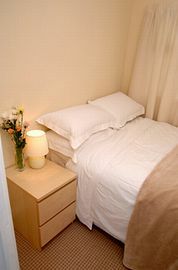 Duvet pillows and bed linen provided for one double bed. Private secure lawned garden with picnic table. 2 minutes stroll to the beach. Local Services: 2 minutes stroll to the beach. Pubs, restaurants and take-aways in the village (15 minute walk). From London and the M25, take the A12. Pass the exits to Colchester West and Colchester Central, then join the A120 signposted Harwich (see 'all directions' below). Follow the A14 (signposted Felixstowe/Harwich) until you are South of Ipswich. Join the A12 signposted London. After roughly 10 miles, leave the A12 at the exit for Colchester and Harwich (A120). Join the A120 towards Harwich. (see 'all directions' below). After joining the A120, drive about 4 miles to 1st exit, A133 (signposted Clacton). After 1 mile, you'll reach a roundabout, go straight - continuing to follow the A133. Continue for about 1? miles to a roundabout with a garage and the Bowling Green Pub/Hotel. Take the 2nd exit (still the A133) to Clacton. After approximately 3 miles you'll reach another roundabout, go straight over and travel another mile until you get to St Johns roundabout. Take the 4th exit, St Johns Road, signposted for Jaywick and St Osyth. Follow this for about 1 mile. On second mini roundabout, take the 1st exit (left) on to Jaywick Lane. Follow for about 1 mile. You will reach a double mini roundabout by a row of shops and the 3 Jays pub. Go straight over on to Golf Green Road. Follow in to Broadway, then in to Tamerisk Way. You will come to a cross roads, go straight over. Sweet Tina's shop will be on your right. After 200 yards you'll get to a mini roundabout, turn left and travel along the promenade. At the end of the promenade turn right and Lincoln Avenue is on the left. Seaside Cottage is number 14. You can park your car directly in front of the property. There are coach and rail services in to Clacton on Sea. There is a regular bus service from Clacton on Sea to Jaywick.